The Barkly Homestead 209 Kilometres along this artery to the Territory marks the entrance to the Barkly Tablelands. 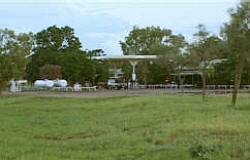 Here you'll find an oasis roadhouse in landscape surroundings with all amenities. Traditional 'Southern Cross' windmills provide good photographic subjects against the flat plains and bright blue sky.